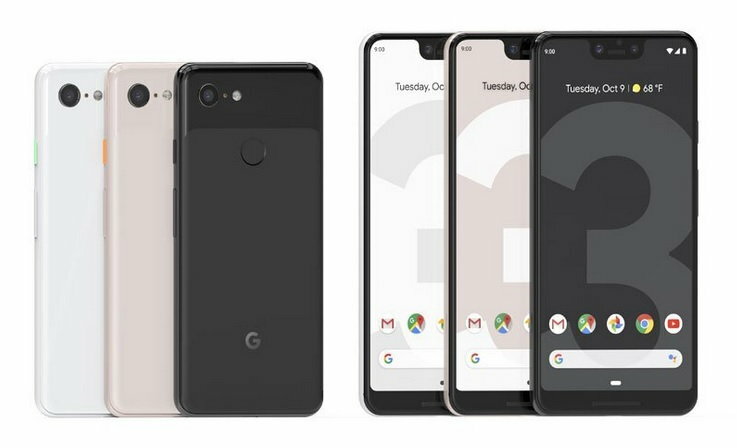 Google on Tuesday finally launched its new Pixel devices the Google Pixel 3 and Pixel 3 XL at an event in New York. The two new phone comes with really impressive hardware and software upgrades. Both the phones comes with new “Active Edge” feature to perform certain task on the phone. The same feature was also used on the HTC U11 smartphone smartphone which was used to activate the Google Assistant. HTC has also used this feature on its HTC U11 smartphone. The new Google Pixel 3 features similar but a slightly bigger display than the Pixel 2. It comes with a 5.5-inch display with 1,080 x 2,160px resolution and increased 18:9 screen aspect ratio. The Google Pixel 3 XL, on the other hand, features a bigger 6.3-inch OLED display with 1,440 x 2,960px resolution (532ppi) and 18.5:9 aspect ratio and a Notch above. Both the device also features an Always-on display with Corning Gorilla Glass 5 protection. In the camera department, Both the devices sports world’s best best smartphone cameras according to Google. The Google Pixel 3 sports a really impressive singe 12.2 MP dual-pixel camera with f/1.8 aperture. The camera also features Autofocus, dual pixel phase detection, Optical, electronic image stabilization, Spectral, and flicker sensor which lets you know about the objects seen on the image while taking photos. The rear camera can also record videos in Full HD and 4K resolution at 30fps. On the front, the Phone has an 8 MP wide-angle and telephoto cameras with wide-angle: f/2.2 aperture & DFoV 107° and telephoto: f/1.8 aperture & DFoV 75°. As for the Google Pixel 3 XL cameras, there are no change in the cameras in both two devices. All the camera specs are identical to Pixel 3 device. Under the hood, both the new Pixel phones come with Qualcomm Snapdragon 845 64-Bit Octa-Core processor coupled with Adreno 630 and 4 GB LPDDR4x RAM with 64 GB and 128 GB storage with no expandable storage support. The Pixel 3 and the Pixel 3 XL packs a 2915 mAH and 3430 mAh battery and also includes a 18 W/2 A USB type-C charger. Both the phone also comes with 18 W fast Qi wireless charging support. Both the phones will be available in the US starting October 19 and Europe from November 2. The Pixel 3 has bee priced in Europe at €860 for the 64GB model and €960 for the 128GB one. The Pixel 3 XL, on the other hand, have been priced at €960 and €1,060 respectively. In the US the phones has been priced at $800 for the Pixel 3 and $900 for the Pixel 3 XL. In the UK the prices are £739/£839 for the Pixel 3 and £869/£969 for the 3 XL. In India, the Pixel 3 and the Pixel XL have been priced at Rs. 71,000 for the Pixel 3 and Rs. 92,000 for the Pixel 3 XL. Both the phones will be available for pre-order bookings in India via Flipkart online store starting on Thursday, October 11.